With a relentless onslaught of new online promotional media that go way beyond old-school websites, banner ads, and email blasts, consumers are just tuning out marketing initiatives that don't appeal to their increasingly connected, digital lifestyles. A world of quaintly interactive HTML and Flash-based "new media" web experiences has morphed into a digital universe of augmented reality, advergames, social networking, and virtual worlds -- one that's highly personalizable and uniquely shareable. And now that consumers are actively creating and participating in communities of interest (everything from politics to kickboxing to Kim Kardashian), building brands in the digital age has come down to a single word -- "experience." And on Madison Avenue -- and for many marketers -- it's getting hard to keep up. So what's the secret to marketing to those weaned on TiVo, Facebook, smartphones, and Twitter? Goodbye "new media"; hello now media. 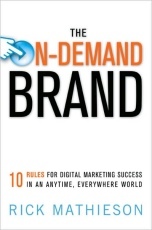 The On-Demand Brand presents an inside look at digital strategies being deployed by brands like Burger King, BMW, Doritos, Sears, Pizza Hut, the NFL, and others, getting to the root of what works -- and what doesn't -- in an age of immediate, malleable, and very social real-time media. Today, companies such as Warner Brothers, McDonald's, Unilever, Kellogg's, and others have succeeded in moving beyond the first wave of viral video, social networking, user-generated content, and mobile marketing campaigns, and are now thinking much bigger, bolder, and far more bodaciously. Something cool, and truly profound, is happening in the on-demand economy. And through lessons from some of the world's most successful digital marketing initiatives, The On-Demand Brand will give you a thorough understanding of the best strategies for connecting with your audience, and inspiring the kind of interest and loyalty your brand deserves.